This formula above is one of the many staggering relationships found by mathematical genius Ramanujan – a largely self-taught Indian mathematician from around the turn of the 20th Century. It has been described by some mathematicians as Ramanujan’s most beautiful formula – as it shows a remarkable connection between an infinite series, a continued fraction, and 2 of the fundamental mathematical constants – e and pi. Neither the series nor the continued fraction can themselves be expressed in terms of pi or e – and yet they still sum to the expression on the left. Not only is it aesthetically pleasing, (can mathematical equations be said to be beautiful?) it also raises wider questions about knowledge – Ramanujan would often claim that these equations “came” to him – ie. that they were self evident. Where did this knowledge come from? And why do the constants pi and e appear in so many different fields and so many different equations? 2) A Numberphile video about Ramanujan’s Constant (links to prime factors and complex numbers). A little bit involved – but pretty interesting – and again it raises the question of how mathematicians like Galois and Ramanujan arrived at their equations). Like , Indian mythological god Krishana had two mothers (Devki & Yasoda). 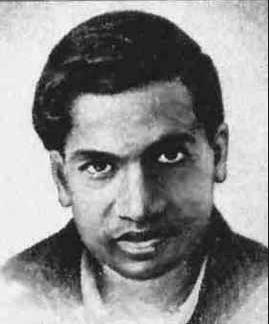 Ramanujan had one of his mother,mathematics who taught him.